SELLING A GUITAR IN 2017? BUYING A GUITAR FROM US OUTSIDE THE EU? End to End application service. Whether your selling/buying a guitar through us or hoping to sell you guitar to someone in the future overseas. you need to know about this! ​The information below will be updated on a constant basis and applies to anyone wishing to sell or buy a guitar to us or privately. As it stand, our understanding for EU and UK customers is that this will not affect your ability to sell or buy a guitar through us, you will not need to apply for a permit if sending a guitar within the EU borders. For USA/CANADA/AUSTRALIA/REST OF WORLD customers selling through us, we will be able to guide you through the process of obtaining a permit to sell your guitar. Dont risk sending your guitar internationally to a buyer and risk having customs enforce penalties or turn your guitar back, they are within there rights to destroy the guitar! All you will need is the addition of a permit when selling or purchasing a guitar through our store or home page and we will help you every step of the way to make your sale or purchase as easy and care free as possible. You can also sell your guitar via Consignment selling service! 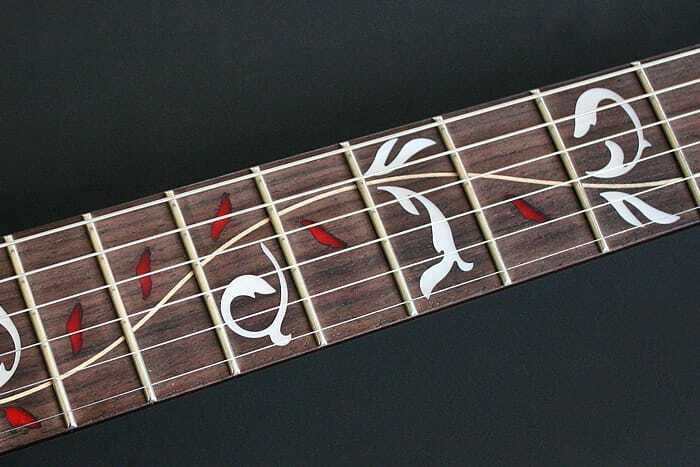 Industry leaders in the US, UK and around the world are starting a discussion to lighten the rules on the smaller quantities you will find in fretboards. While there is no guarantee that this will happen this is a conversation that is happening. We’ll start to see manufacturers using less and less Rosewood until this can be resolved. Brands like Chapman and Dowina have already started changing their models to use Ebony boards instead of Rosewood. Because of the cost of Ebony however we are sure to see more companies using man made materials like Gibson’s Richlite or other alternatives like Baked Maple. ​A new regulation takes effect on January 2, 2017 that calls for documentation when shipping instruments internationally that contain any amount of any kind of rosewood or certain types of bubinga. It does not apply to instruments shipped within the borders of your country or instruments carried for personal use while traveling internationally [unless they contain more than 22 lbs. (10 kg) of the regulated woods]. This is a developing story, with details emerging as government agencies figure out how to create processes around the new requirements. To what degree they are enforced remains to be seen. How Can Sell My Jem Help? We now offer a service for UK customers selling any guitar abroad, ensuring that the application and permit for CITES is completed and our turn around time is faster than anywhere else in the UK. Just contact us if you would like us to handle your CITES permit and open your guitar up to a world of potential buyers. If you have been having problems selling your jem or are finding it difficult to sell due to these new restrictions then you could consider selling through Sell MY Jem as we take care of the process for you on your behalf. Dont want to sell to us? The New Regulation on Rosewood and BubingaThe Convention of International Trade of Endangered Species of Flora and Fauna (CITES) held a conference from September 24 - October 4 this year in Johannesburg, South Africa where it was decided that all species of rosewood under the genus Dalbergia and three bubinga species (Guibourtia demeusei, Guibourtia pellegriniana, and Guibourtia tessmannii) will be protected under CITES Appendix II. Kosso - sometimes called African rosewood (Pterocarpus erinaceus) - will also be protected. For example, a seller in Nashville looking to ship her 2013 Martin 000-28 with East Indian rosewood back and sides to a buyer in Canada must apply for a re-export certificate, pay the application fee, receive the certificate, and include that document with the guitar when shipping. For sellers in the United States, CITES re-export certificates must be applied for through the US Fish and Wildlife Service. You can download the application here. Representatives of the agency have said that initial turnaround times on certificate application may be on the order of months. For more information, you can contact their office at (703) 358-2104 or at managementauthority@fws.gov. You can read the official letter from US Fish and Wildlife here. If you contact US Fish and Wildlife, please keep in mind that they did not suggest or create this regulation - the parties of the international CITES conference did. The employees of US Fish and Wildlife are trying to work with manufacturers and sellers to develop streamlined processes around this. The reason for the billion-dollar demand for rosewood - and the subsequent trafficking - has less to do with musical instruments and much more to do with furniture. In particular, China’s high-end furniture market created enormous demand that led to severe deforestation of several Dalbergia species in Thailand, Vietnam, and several other countries. What This Will Look Like In Reality? The number of musical instruments containing some amount of rosewood, cocobolo, bubinga or kosso that cross international borders each day is staggering. To put it mildly, the new regulation creates a lot of new work on very short notice for government agencies around certificate approval and issuance. Instruments sold to buyers outside your country will be subject to CITES enforcement by the receiving countries. The consistency and vigilance in checking for documentation is something that remains to be seen. As this is a developing story with emerging details from CITES and US Fish and Wildlife, please stay tuned for updates and new information.